I’ve compared Charter Schools in PPS not against the entire school district as in your example, but on a school to school evaluation. Anyone can do this thanks to the Corbett funded web site paschoolperformance.org. There you can compare ECS vs Pittsburgh Colfax and see that scores are similar while demographics are also similar (actual ECS has more special ed population, less black population, econ. dis students same). I believe that the district thinks of Colfax as a great school why wouldn’t we say the same of ECS versus demonizing it? Also compare Pittsburgh Lincoln vs Urban Pathways. In my opinion both schools are failing, but Lincoln is actually outperforming Urban Pathways in many categories. In education everything is local and school-to-school comparison is much more valid than these individual schools versus the average stats of PPS, IMHO. I’d also like to note that this blog has lobbied to opt out of testing while it uses this same test data to demonize other schools. Without testing there is no data to compare schools. Which do you prefer? Happy Halloween! Steve, your question about comparisons is a good one. 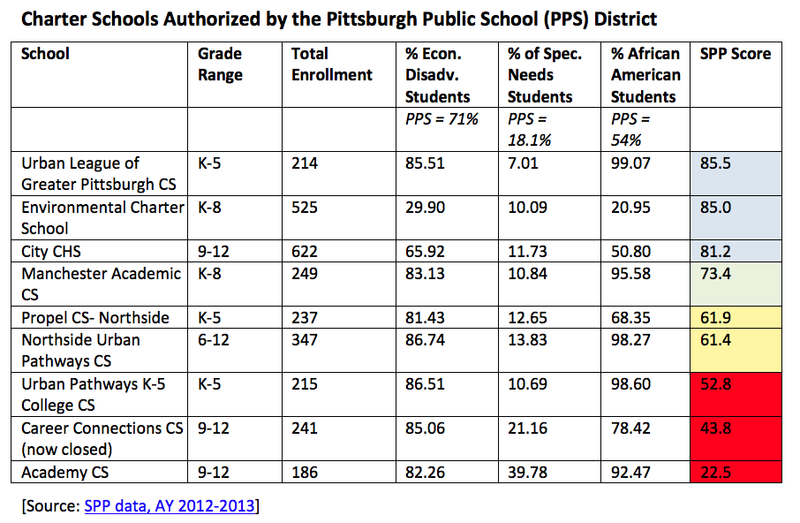 The point is not whether an individual charter school can outperform (or is under-performing) a single school in the district. Charter schools ought to be educating the same range of students as the district they pull from. Otherwise they are not representing the local student population. So the comparison to the district as a whole is appropriate. I believe if you read this post you will agree that I am not demonizing any charter school. In fact, I compliment several of them! I think we all want what ECS offers — for all our kids in PPS. An important question is: how are we going to get that? We have plenty of ways of determining student achievement and success without a whole bunch of high-stakes tests (for instance: grades, retention and drop out rates, graduation rates, proportion of students taking AP courses, etc.) One big problem with trying to reduce “school performance” to a single number so that it can easily be used to rank order and compare schools, is that it completely over-simplifies what is essentially a complex system of human relationships. It doesn’t come close to “measuring” the learning community in a school building. It doesn’t capture all the wonderful things we know go on in a place that wind up being labeled “failing” or “needs improvement.” And most of those high-stakes-tests don’t really tell us anything new — they are great at measuring poverty. That’s what all standardized tests do really well. And we already know which kids are living in poverty, which schools and communities are struggling with poverty. Worse, of course, is that rank sorting and comparisons are not being done to help students, and send needed resources, but to label and condemn. What are your thoughts on school comparisons without high-stakes testing? Charter school, which are PUBLIC schools, provide competition for local public school districts. This forces districts to keep their constituents happy or risk losing them to a public charter school. A lack of options produces a system of indentured students. Parents with enough money can buy their way out of the school district that doesn’t meet their expectations by purchasing a new house in another district or by sending their children to schools where they would have to foot the bill themselves. Parents must have a way to opt out of a district that doesn’t meet expectations without having to pay for a new house in a more desirable district or join a pay-to-learn private school. This is not just about the quality of education, which is also suspect in many public school district. It is also about breaking up the monopoly that is the public school system and providing options to parents and students. Undesirable charter schools will fail and close as Career Connections did. Public school districts need to face the same challenges and competition. We have years of data now that clearly show that “choice” and “competition” do not create better schools. Yet Americans love the idea of “choice.” It fits with our view of the world as consumers. But public schools are not boxes of cereal to choose from in the grocery aisle. Schools are public goods, not consumer goods. Think about other public goods and services that you use, such as public safety. We don’t want to choose from different police providers, we want our local police department to be great: to offer high-quality service that meets the needs of our local community. Choice is a free market ideology. Markets do a good job making stuff and selling it. But they also create extreme inequality, with winners and losers. Choice alone doesn’t guarantee quality: you can stick five kinds of dirt in those cereal boxes and offer them as a “choice,” but nobody wants to eat that. We really don’t need more choices in public education. We need great public schools in every community, that any parent would be happy to send their children to, and that meet the needs of local families. We don’t really have any choice at all if our local public school is not a high quality option. Consider the suburbs that generally have great public schools: students go to their feeder school and charters barely exist. In fact, “choice” is really only talked about for poor kids and communities of color. Why is that? I may be in a unique situation here but in State College there are multiple charter schools (brick and mortar) and students attending cyber schools as well. I think that we can agree State College, Bellefonte, Penns Valley, etc. are good school districts yet there are many charter schools here and they are not all serving students of color or poor families. I have noticed that you have gone a bit soft of Governor Corbett these last few posts. With the election being in just a few short days I must say I am a bit surprised by your choice of topics. Why are you not taking these last few opportunities to review all the terrible things our current Gov has done and continues to do to education? Do you know that in the history of Pennsylvania we have ALWAYS given our governor a second term. That is scary right now!! Please at least do a review of all of your posts on Corbett before the final election which will decide his, and dare I say our educational systems, fate for the next 4 years. Steve, you mention special education populations and I’d like to address that. It’s not enough to compare the overall percentage of students receiving special education services in a school. The costs associated with providing special education services differs widely depending on the needs of each student. For instance, ECS has an overall 10% population but 34% of those students only receive speech and language services, a low cost service compared to services needed for students with more significant disabilities. Unfortunately, charter school funding doesn’t take this difference into account and traditional public schools must overpay charters for these students. Excellent post! You tackled charters, vouchers AND tax credits! This deserves to be shared widely. I know I’ll be giving it lots of shout outs on Facebook and Twitter! Well done!